There has been a strange little bug passing through our doors here. I am a firm believer that sometimes when we have too much going on we tend to catch a little something that makes us hole up and nurture ourselves a bit more than normal. The first couple of weeks back after the holiday have been a stretch in many ways. Here is my new breakfast, jumbo porridge oats, who knew! I brought them by mistake and wasn't quite sure whether they would become the creamy porridge I was used to. A good slosh of soya milk and a gentle heating makes a hearty, chunky bowl of porridge. Add some chopped banana, raisins and drizzle on the honey. Very nurturing indeed. Can you see the picture in the background? This is Sidmouth in Devon. It's a very genteel British seaside town, slightly lost in time with beautiful red cliffs and a pebble beach. A large piece of my heart lives here. My Mum used to live here. Many car journeys were made back and forth here over the last 10 years. I'm a little sad that i haven't managed to get there this summer. It's calling me. Perhaps a little trip in the Autumn when my little dog is allowed to have a paddle on the beach. Do you know Hesta of Clover clogg? she makes the most wonderful funky and crafty dolls, amongst other things. She has just opened a little workshop near the beach there, with a handpainted floor sign saying, Sew a little happiness, I am a little envious of course. Good luck Hesta, hope to meet you there one day. I have a lot of work to do here now to cozy up this space. 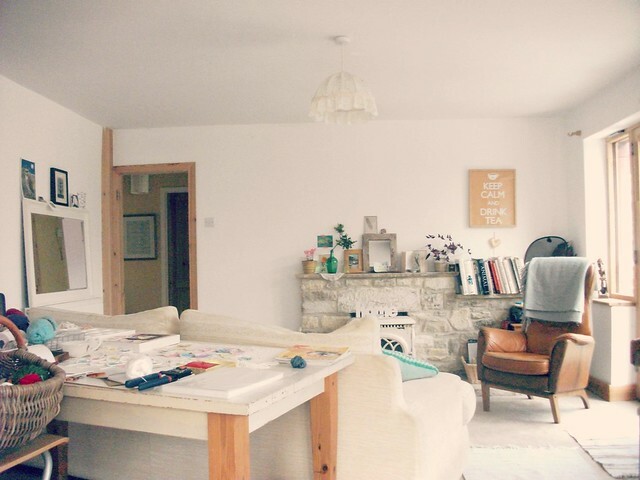 I love the light space and yes I'm still sleeping in the conservatory. Apparently I'm not alone here. The cold will win in the end of course! and yes pompoms, I did say that, nearly forgot! I have a slight craze on here. I will show you more soon and my autumn inspiration too. I'm making them the old fashioned way and a crochet hook is very useful for pulling through the threads. Their actually coming together quite quickly. Anyway must go and make more, do you feel a pompom coming on.......?! 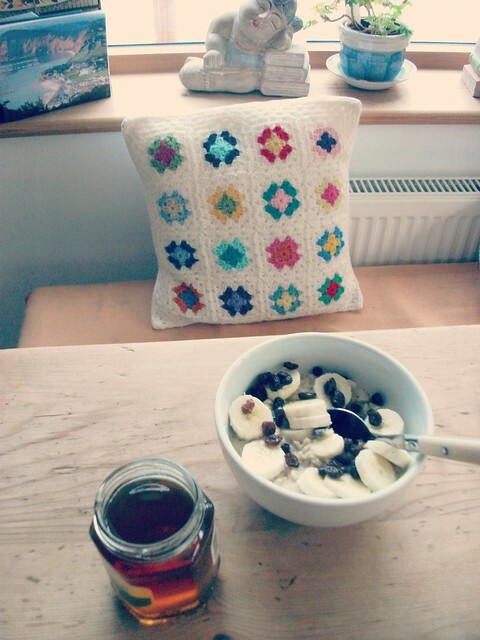 Labels: "cozying up" "porridge" "pompoms"
I've just pinned your pompoms on my interest board!!! love them!!!! Oh that looks like a scrumptious breakfast Heather - that should warm the cockles of your heart! I really like your white space, it looks so gentle and peaceful, and I also like your worktable with your little bits of this and that on it. 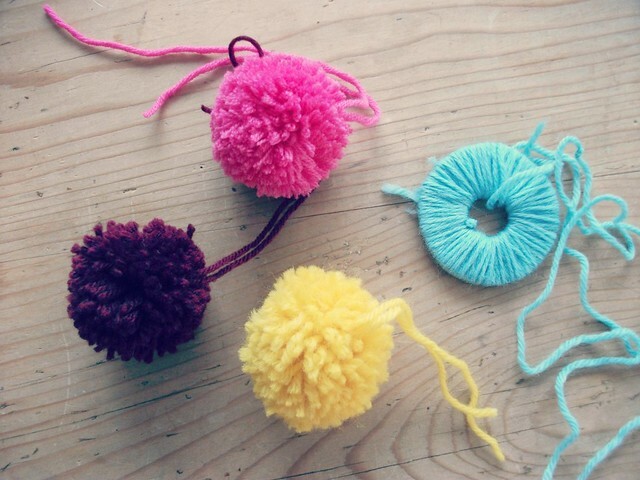 Sweet pompoms in lovely colours - I used to make them that way, following on from my Mum's instructions. Love the white room. I always have preferred a white decor than a color full one. Maybe it has something to do with how we like our minds to be. CLEAR and calm..Then can bring the messy on..what say Heather? love your room and your pompoms! Love the look of that bowl of porridge, love your pretty white room and love your bright & cheery pom-poms! And extremely healthy... which is important when we are taking care of ourselves. I really like your living room, I love a room that is so full of light, I wish mine were! My teenager always shuts the curtains and blinds so he can see the computer and tv better!!! I also like the lady on your window sill leaning on the books! I think you mean 'genteel' rather than non-Jewish (gentile) lol. Love your blog and recognise the smashing Stylecraft colours that are always in my stash too. PS The teenager will soon be a proper young man one day just like my two, yikes! oops I think I do! Such a lovely calming room Heather - I do love your wing chair! Love your light and very white room...and the colourful pom poms. I stayed in Sidmouth aged 12 / 13. We went with our school for a fortnight during the summer hols and stayed in a girls boarding school in Sidmouth whilst they were on holiday. I can't remember the name of the school but it was walking distance from the town and the Jacobs Ladder beach. We had such a lot of fun in those dorms. The old way is the best way when it comes to pompoms!